I’m incredibly late to the party with this one, but better late than never, right? 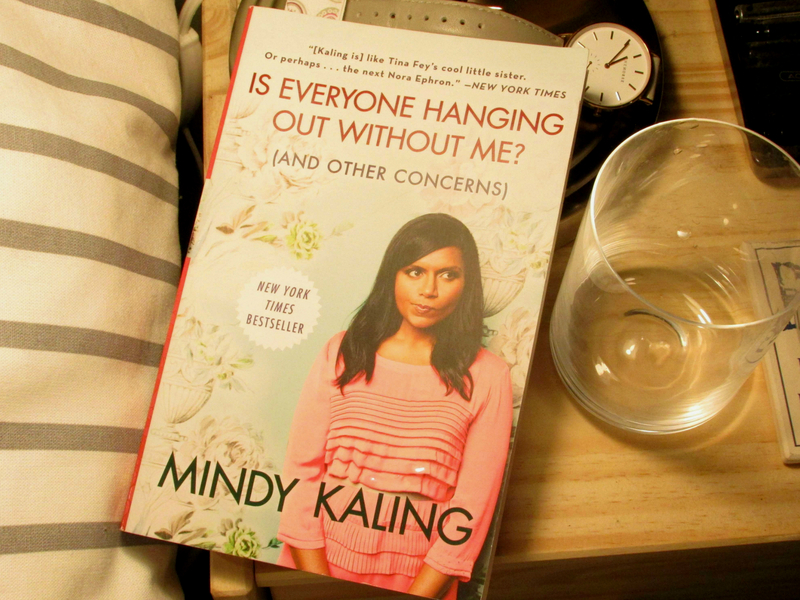 I finally got around to reading mindy kaling’s book, is everyone hanging out without me? (and other concerns), and I had such a good time reading it. as someone who is a) a person who appreciates funny, talented people; b) a woman who appreciates funny, talented women; and c) a woman of color who appreciates funny, talented women of color, I am a big fan of mindy kaling. I’ve loved her since her days in the office, both for her work in front of & behind the camera. the book is organized into chapters that are comprised of vignettes from her life. some particularly memorable stories for me were about her childhood growing up in boston to indian parents who met in africa, her time in nyc post-college, living with her two best friends, and her first apartment in l.a. after getting hired as a writer for the office. my hands-down favorite chapter, though, was the one in which she talks about body image. she talks about being at a photoshoot for people magazine for the issue in which she’s named one of the most beautiful but, ironically enough, the stylist doesn’t bring any dress over sample size, which mindy is not. how does she handle it? after a crying session (love the honesty), she picks her favorite gown out of the ones available, has the seamstress cut it open in the back to make it fit, and just has them make it work. she ends the chapter with, “I spend the rest of the shoot having a blast and posing goofily for photos with my pal, like the awesome, Most Beautiful, and Least Dressable, Girl that I was.” I mean, how awesome is that? as someone who’s been in similar situations too many times to count, I can’t help but want to stand up & clap. if you’re looking for a feel-good, empowering, honest, and funny-as-all-get-out read, pick this one up. it’s a lovely read. p.s. not that you should judge a book by its cover, but this one is pretty, which is always a plus. p. p. s. her instagram is a daily read of mine. it never fails to make me smile, guffaw, or just plain laugh out loud.